David O’Reilly brings his award winning short film ‘Kubrick by Candlelight’, which is set behind the scenes of Stanley Kubrick’s Barry Lyndon, to Irish views with a screening on RTE2 Shortscreen at Midnight this Monday, September 24th, 2018. 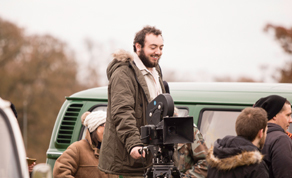 A recipient of the Film Offaly/Filmbase Bursary 2016, ‘Kubrick by Candlelight’ has since premiered at festivals across Ireland, the UK, Europe and the USA. So far it has garnered over 20 nominations and collected 5 awards. “I’m incredibly honoured and excited to have been selected to be part of Shortscreen on RTE2. It’s almost exactly a year since we first screened at Encounters Film Festival and since then we’ve had a great response to the film at film festivals and events in Ireland, the UK, Italy and the USA. Along the way we’ve picked up awards and nominations which is always great and recognizes the hard work of the all the cast and crew who made it happen”. In 1973 Stanley Kubrick came to Ireland to shoot “Barry Lyndon” creating great excitement. The film brought jobs, scams, candles, stories and ultimately trouble to the local people. Infamously a threatening phone call drove Kubrick, his family and the crew from Ireland and this romantic comedy follows the lives, laughs and loves of an Irish extra playing an English soldier and a young British crew member in amongst the travelling circus of the Hollywood crew– star crossed lovers from different sides of the camera track. Who made all the candles? And who made that call? Narrated by Brian Cox. Darragh O’Toole (‘South’, ‘Red Rock’), Amy Hughes (‘Vikings’), Phelim Drew (‘Angela’s Ashes’, ‘My Left Foot’) join newcomers Mark Lawrence as Mark Thornton and Michael Thomas Nolan as Stanley Kubrick. Rounding out the cast are internet sensation, impressionist and comedian Al Foran as Mick Molloy as well as Mark Webb (‘Colour Me Kubrick’), Lisa Moore and Alan Curran. The film is narrated by acting legend Brian Cox (‘Manhunter’, ‘Churchill’, ‘Braveheart’). ‘Kubrick by Candlelight’ screened as one of only two Irish short films selected, at the prestigious DC Shorts Film Festival in Washington DC in mid-September and will next be seen at Disappear Here Film Festival in Ballyliffin, Indie Cork Film Festival, Bolton Film Festival, Southampton and Norwich Film Festivals. It has won Best Film at Waterford Film Festival, Best Cinematography at the Richard Harris Film Festival in Limerick, Best Screenplay at Chelmsford Film Festival and Kino Film Festival, Manchester. It won Best Comedy at Fastnet Film Festival in Schull in May 2018. David has been nominated for Best Director at the Richard Harris Film Festival and YDA Ireland 2018. ‘Kubrick By Candlelight’ screens at midnight September 24th, 2018 on RTE2 as part of the Shortscreen strand.